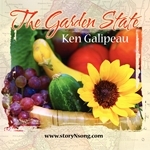 "The Garden State" was written for a program I did for the Camden Children's Garden where the theme was New Jersey and Blueberries. I gathered together many fun facts about New Jersey. I included as many of the state "identifiers" as I could. Can you guess them after listening to the song? Many many people have told me "The Garden State" should be the New Jersey State Song! the beautiful plants of the Garden State. the fields and trails of the Garden State. with the sound of the shore at the Garden state. the whole wide world in the Garden State. (well it ain’t that great). "The Garden State - Piano Accompaniment" Full Sheet Music.